Our Razor scooter kit includes: (5) Micro-BlingZ LED modules, (1) 9 VOLT battery holder w/switch and (1) 9 VOLT battery, they are pre-wired and ready to install on your Razor. Follow the simple to use installation instructions included with your modules. Now anyone can ride safely at night in the cul-de-sac, local skate park or your hangout spot. This kit uses our micro-BlingZ modules which are about 1/2 inch X 1/2 inch square, they require very little space to install and make it safer for the younger kids to ride at night. Our LED kits make riding at night fun and safe, the kits are affordable and kids love the look of LEDs on their favorite ride! All of our LED kits come in a choice of (4) colors, red, white, blue and green just specify your color when ordering. If you wish to order (2) or more colors please make a separate order for each color. 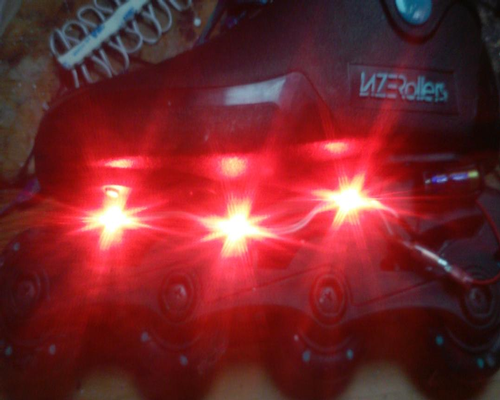 Our Rollerblade kit includes: (6) Micro-BlingZ LEDs -(3) LEDs per skate, (2) 12 VOLT mini-batteries and (2) Battery holders pre-wired and ready to be installed on your skates. Follow the simple and easy installation instructions included with your modules. Once installed you are ready to enjoy skating all night whether you are at the skating rink or skating your local spot you'll get noticed with your new LED lights! Our small recreational kits use Micro-BlingZ modules which are much smaller than our standard "Mini-BlingZ" modules, allowing our customers to attach LEDs to even the smallest of transport products. Order yours today and don't let the dark keep you from skating all night long! All of our LED kits come in a choice of (4) colors, red, white, blue and green simply specify color when ordering. If ordering (2) or more colors please create a separate order for each color.